Taranis completed its 2017 ore processing from the SIF outcrop in early October, 2017. The ore was processed through a Mt. 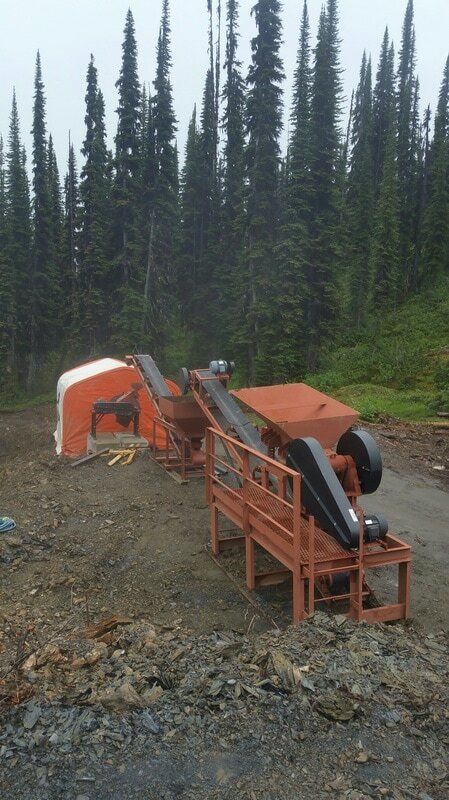 Baker 2 tonne/hr plant that crushed ore to 3/4", and was run through a hammer mill and reduced to 0.8 mm before being processed on a 4' by 8' shaker table. The ore was mined from the SIF outcrop located north of the processing facility, and was transported 300m along a pre-existing road. The ore was broken at the SIF outcrop with the aid of an excavator with a large hydraulic hammer. The ore was reduced to approximately 6"-8" in size at the ore source, and a Bobcat excavator transported the ore to the processing site. The shaker table produced two products, the first of these was a "super concentrate" that contained abundant coarse-grained gold, but was volumetrically small. The second product was a larger sample called the "concentrate", which contains a considerable amount of gold, but is typically much finer than the product found in the "super-concentrate". Both of these products contain significant gold and are currently being processed to recover the gold at Met-Solve Laboratories Inc. Based on the results of the analytical work, the final step will be to refine the gold. The Tails and Middlings from the shaker table were disposed if in an area that was previously used as an exploration trench. This trench was modified in 2016 so that it included a dam to contain the tails/middlings. The tailings pond was successfully reclaimed in October 2017 under the supervision of Norwest Corporation. The Middlings, Tails, and Concentrate products were subject to exhaustive study, much of which is included here!